How did the situation in Argentina end? Not too well. Economic depression, mass insolvencies, bank runs, forced seizure of deposits, unemployment and underemployment exceeding 40%, blood in the streets, a fall of the government, a complete reneging of the terms of the "rescue packages," an abandonment of the hard currency monetary regime, a mega-devaluation, and a massive default of foreign debt obligations. Unfortunately the euro today imposes a kind of gold standard on European countries – it forces them to adjust to excessively high domestic prices, large trade deficits, and/or large fiscal deficits in the same way they would have had to adjust under the gold standard, and I don’t think that is politically likely to be acceptable. The countries that need depreciation to regain competitiveness or monetization of the debt to regain control of the deficit will have to choose between adjusting via deflation and high unemployment or exiting the euro. Politics makes the latter more likely. Moreover, there isn’t enough gold around for a gold standard to be practical without massive dislocation. That’s why a gold standard is a really bad idea. Is the Fed looking at the right indicators? The modifications are not expected to lead to tighter financial conditions for households and businesses and do not signal any change in the outlook for the economy or for monetary policy, which remains about as it was at the January meeting of the Federal Open Market Committee (FOMC). At that meeting, the Committee left its target range for the federal funds rate at 0 to 1/4 percent and said it anticipates that economic conditions are likely to warrant exceptionally low levels of the federal funds rate for an extended period. In addition, the Board announced that, effective on March 18, the typical maximum maturity for primary credit loans will be shortened to overnight. Primary credit is provided by Reserve Banks on a fully secured basis to depository institutions that are in generally sound condition as a backup source of funds. Excuse me, isn’t that a tightening of credit? How are these changes not “the not expected to lead to tighter financial conditions”? The announcement was a bit of a surprise. The question is, why did they do it? Were they looking at the yield curve, which is steeply upward sloping? This would be an indication that conditions were returning to “normal”. A double-dip in the cards? Meanwhile, in January, new accounting rules will kick in which will force banks to move off-balance-sheet “structured investment vehicles,” “trust preferred assets” and other beasts onto their balance sheet, which is expected to result in some sharp hits to bank capital. In response, regulators such as the FDIC will most probably be called upon to look the other way for a while. In the meantime, Mish is warning about the Commercial real estate apocalypse in 2011-2012. Back in the real economy, indicators of trade remain weak. The Baltic Dry Index, which is reflective of shipping rates, isn’t exactly going like gangbusters. There seems to be no rebound in rail traffic either. With commodity prices seemingly rolling over (my Inflation-Deflation Timer model turned neutral in late January), all indications are from the markets and the economy are pointing to at least a pause. If the Fed mistakenly tightens monetary conditions, the chances of a double tip will undoubtedly increase. It's an amusing but instructive video of the dichotomy between the philosophies of Keynes and Hayek, of the Austrian school of economics. It also starkly highlights the philosophical divide between policymakers and investors. This is the nature of the End Game I have been writing about. The decisions are now political. 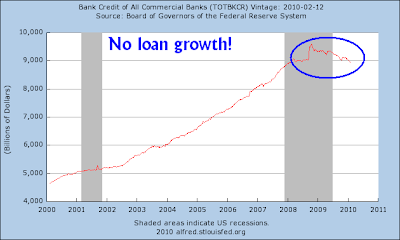 How do we unwind the debts and the leverage? How much pain do we postpone and how much do we take on today? It is the same question for much of Europe, Great Britain (serious problems there), Japan (which is a bug in search of a windshield), and the US. We now have a limited number of path-dependent options. By that I mean the political paths chosen by the various governments will dictate the economic path we go down. It's no wonder why investors can't make a definitive decision on the crucial inflation vs. deflation call either. S&P 500 500 futures are down around 1% as I write this in the wake of the Fed's surprise discount rate hike. Despite the negative news, it's important to take deep breath, step back and analyze the market with some perspective. In the framework outlined in my post bulls are losing control, here are some impotant relative performance charts that I am watching as signs that the bears may have taken control of the market. The chart below shows the relative performance of the Morgan Stanley Cyclical Index (CYC) relative to the S&P 500. CYC staged a relative breakout in early December and continues to lead the market. Should it break down below its relative support line, it would be a sign that the bears have the wind at their backs. The chart below shows the relative performance of the Financials compared to the S&P 500. Financials have two unique characteristics in this cycle. First, they are where the stresses in the system show up and therefore a good canary in the mine as to the health of the market. The sector is in a relative downtrend and it's on the verge of a breakdown and I expect that it would decline further at the open. Should it decline below its relative support zone, it is another signal that the end of a brief period of ursine hiberation is at hand. Diversification will give some protection during slight or even moderate market perturbations. When a real disaster hits, supposedly diversified investments are subject to similar losses as concentrated positions because our portfolio constructs do not include sufficient non-correlating assets. In other words, in major sell-offs, everything moves together, albeit at varying rates. Losing less than market averages is not a comforting factor when your portfolio is down 30% to 50%. What has caught our attention is that during almost every dislocation, especially the major stock market declines (1987 and 2008), systematic, trend-following systems garnered returns that could have made a significant and positive impact on portfolio performance. In 2008, BarclayHedge’s Systematic Index, a weighted average of some 448 CTA’s, rose 18.6% while the S&P500 declined precipitously (-38.5%). Genesis Futures’ NT4 system adheres to this paradigm. In other words, CTA returns do well during crisis periods when the stock market goes down – and that’s diversifying. This brings to mind the story of another Holmes, Sherlock Holmes, and the story of the dog that didn’t bark. What Thomas Holmes and other CTAs don’t mention is the weakness of CTA trend following systems. The chart below shows the yearly returns of the BarclayHedge CTA Index. Trend following models simply don’t perform well during periods when the system can’t find a trend. By contrast, my Inflation-Deflation Timer model, which is also based on trend following principles, performs in line with a 60% stock/40% bond benchmark during “normal” periods and outperforms during crisis periods. Instead of showing negative returns in 2009, as the BarclayHedge CTA Index did, the Inflation-Deflation Timer had a perfectly respectable 2009 return of 18.0%. This shows that investors using trend following models need to evolve beyond the simple application of these models in order to get more stable returns. The Inflation-Deflation Timer model is a proof of concept that a trend following investor can have his cake and eat it too. You get positive returns when other markets are bad and returns roughly in line with other asset classes during other times. Inflation or Deflation? Cancer or heart attack? I have been pounding on the inflation vs. deflation theme for some time, largely because I believe that this is likely to be the Investment Call of the Decade. Get it right and you’ll be a hero, but get it wrong and you’ll be a goat. Why is making such a forecast so hard? [W]e have made a series of bad choices, often the easy choices, all over the developed world. We are now entering an era in which our choices are being limited by the nature of the markets. Not only are we in a path-dependent world, but the number of paths from which we may choose are becoming fewer with each passing year. Our economic future is more and more a product of the political choices we make, and those are increasingly difficult. We have no good choices. We are left with choosing the best of bad options. Some countries, like Greece, are now down to choices that are either dire or disastrous. There is no "easy" button. We are in the fullness of time approaching the End Game. In country after country, the choices that have been made over the last decades will yield a Greek situation, where there are no good choices. And the longer the hard choices are put off, the more difficult they will become. For some countries it could mean deflation. For others, it will look like inflation on steroids. Countries with sensible budgets and policies will thrive. How the piper gets paid is dependent on future policy decisions, which are unknown. David Merkel of Aleph Blog says that governments have three choices, inflate, raise taxes or default. The first will lead to the cancer of rising inflation, the last two to the heart attack of a deflationary collapse. I cringe whenever someone says “this time is different.” However, the policy choices that we face indicate that we are entering an era where things are different, but not unprecedented. The chart below from Macquarie Equities Research shows that macro-economic volatility has significantly risen. Is this a New Era? Yes. Is this time different? Yes. 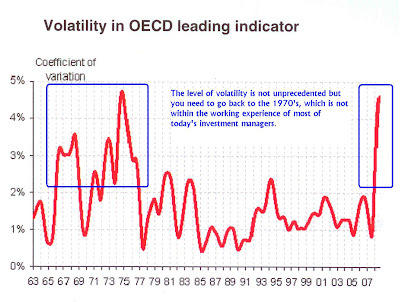 The OECD experienced similar levels of macro-economic volatility back in the 1960’s and 1970’s. However, most of the investment professionals today have not experienced these kinds of macro conditions in their working lives and may not be able to adequately respond to this sea change. Investment policies such as buy-and-hold which have worked well over the last 30 years are likely to be sub-optimal. Neither is the gold bugs' solution to buy gold, as the yellow metal is likely to perform poorly under a deflationary scenario. Dynamic asset allocation strategies, such as the Inflation-Deflation Timer model which are based on trend following principles, are likely to be better tools for navigating the treacherous seas ahead. The history of the Tea Party Movement has been one of peaceful advocates of limited government and conservative fiscal policy, with little comment on social policy. For example, there are questions we would have liked this foreign terrorist to answer because he lawyered up and invoked our U.S. Constitutional right to remain silent…Our U.S. Constitutional rights. Our rights that you sir fought and were willing to die for to protect in our Constitution. The rights that my son, as an infantryman in the United States army is willing to die for. The protections provided—thanks to you sir—we’re going to bestow them on a terrorist who hates our Constitution and wants to destroy our Constitution and our country? This makes no sense because we have a choice in how we’re going to deal with the terrorists. We don’t have to go down that road. Was George Washington a terrorist? A little over two hundred years ago, His Majesty’s Government was involved in a counterinsurgency war in one of the colonies. The rebels eventually won, but not before government troops used a number of harsh tactics which the new rebel government vowed never to impose on its own citizens. The new government affirmed the principles of the writ of habeas corpus, which limits the government’s right to hold prisoners indefinitely without bringing them to the justice system, and the right to remain silent when questioned by the authorities. The rebel government, in case you hadn’t figured it out, was the United States of America. Under the rules proposed by Palin, people like George Washington could have been labeled a terrorist and made to disappear by the government of the day. There would have been no recourse. The government could label anyone a terrorist. There would be no checks or balances. No appeals. At the same time, Tea Party Movement believes in limited government. Do these people really trust the federal government to do anything right? Do they trust the federal government to label someone a terrorist and not make a mistake? Are federal bureaucrats to be believed when they label something a national security matter? Before you answer those questions, remember how the federal government in the guise of the SEC mulled national security status for AIG details. Are terrorists like pornographers? You know one when you see one? People are just getting crankier because money is getting tighter and tighter. The New Yorker article the Populism Problem outlines how the American electorate is just mad, but they are not sure what they want. I wrote before that St. Barack of Chicago was likely to disappoint because expectations for this president were so high. And inevitably he has. And - as the youths wearing pig's head masks on the demo today were keen to point out - there are young people like them all across Southern Europe. Longer term it's a contagious youth unrest from Thessaloniki to Lisbon that Europe's leaders may have to watch out for: "The PIGS fight back," said the banners today. Instead of a straight class divide this crisis has fuelled a more complicated generational one: older workers have been poor before and, some of them will privately admit, can survive being poor again. But for those in their early 20s to see all the aspirations fostered during the noughties cancelled indefinitely is a pretty hard pill to swallow. Meanwhile, more and more states are getting into trouble, services get cut, taxes rise and the risks of populist social backlashes continue to rise. Consider this example of what happens when politics get polarized under economic stress. Trust, credibility and faith are integral elements of financial stability. Perception is reality. It's not what is; it's what's perceived to be. Social mood and risk appetites shape the tape. These axioms should remain on our radar as we, the people, edge ahead. Addendum: I had a reader comment complaining about how I compared George Washington to Osama bin Laden and asking whether Cam stands for camedian. I believe that I published that comment but unfortunately the comment got lost and I apologize. A guerrilla sympathizer finds out that government troops are about to raid the town where he is living. The sympathizer then runs around the town to rally the other fighters to assemble and confront the government troops. Remember that these guerrillas don’t wear uniforms and melt into the population. In a conventional war, captured non-uniformed combatants are regarded as spies and not accorded the niceties of the Geneva Convention. Would that sympathizer be labelled a terrorist? If he is a terrorist, would you consider the head of his movement to be a terrorist? Now consider the famous ride of Paul Revere and draw your own conclusions. One man’s patriot is another’s terrorist. In the short run, however, Bespoke reports that the S&P 500 is 3 standard deviations below its 50-day moving average - a highly oversold condition. My inner trader tells me to wait for the oversold condition to clear up and watch the market reaction for signs of future direction. Now the Technical Take reports that Rydex timers are getting excessively bearish. In addition, the latest Commitment of Traders report shows that large speculators (read: hedge funds) have moved off their crowded long in the NASDAQ 100 to a neutral reading. Get ready for the counter-trend rally. It is always useful to look at sector relative changes once in a while, just to spot any phase changes or shifts in leadership. When I first got into the investment business, a grizzled veteran taught me the basic principles of sector rotation. Early in the cycle, it's the interest sensitives that lead the way. Sector leadership rotates through the equity market spectrum until you get to the asset plays - the inflation hedge stocks at the very end of the cycle. The chart below shows the relative performance of the Financials compared to the S&P 500. Financials have two unique characteristics in this cycle. First, they are where the stresses in the system show up and therefore a good canary in the mine as to the health of the market. In addition, they are interest sensitives where central bank action and the expectations of central bank action manifest themselves. As the chart shows, the sector led the market up from the March 2009 bottom but is in the process of rolling over and is now testing a key relative support zone. If the sector weakens further, it would be an indication that the bears have taken control. At the other end of the sector rotation scale, we have the Energy sector. This is also a useful indicator as much of the rebound has been driven by expectations of Chinese growth which has buoyed commodity prices. Energy stocks have been in a sideways pattern relative to the S&P 500 and arguably in a relative downtrend. This is what technicians call a consolidation pattern, which reflect indecision by Mr. Market. What about the cyclicals? Cyclicals have also led the equity rally on expectations of a strong rebound. The chart below shows the Morgan Stanley Cyclical Index (CYC) relative to the S&P 500. CYC had been leading the market but recently failed at a relative uptrend line and is now testing a support level, indicating perhaps a change in market consensus that the economic recovery is on track. The relative chart of the cyclically sensitive Dow Jones Transportation Average relative to the Dow Jones Industrials is also supportive of my conclusion. In fact, the Transports remain in a relative downtrend relative to the Industrial that dates back to September 2008. When I look at these charts, they tell me that the market is undergoing a phase change. Bulls are no longer in control, but the bears haven't yet taken command. This conclusion is supported by the behavior of Consumer Staples, a defensive sector that hasn't exactly been powering ahead on a relative basis. The stock market appears to be, at best, undergoing a consolidating phase or basing pattern. Should it weaken further, it would indicate a major leg down in stock prices. I had written extensively about why I am not a bottom-up equity quant, largely because the business of bottom-up equity quantitative analysis has become commoditized. Barriers to entry of equity quantitative analysis are falling rapidly. As a consequence, bottom-up equity quant alpha is shrinking rapidly. Here is case in point. A friend recently asked me for my opinion of a service called Market Topographer. The service allows a user to analyze a stock based on a series of pre-determined factors - which makes bottom-up multi-factor modeling a breeze. It even provides for "stress test" analysis, i.e. how would a certain factor have behaved under past episodes of stress such as the LTCM crisis. I have no doubt such a tool is a great benefit to equity quants everywhere. The ubiquitous availability of tools like this accelerates the commoditization trend of equity quantitative analysis. For equity quants, it just means that you need to be more creative about sources of alpha. Don't try to be where everyone is but move somewhere outside the standard bottom-up equity quant framework. The Inflation-Deflation Timer model turned neutral last week after showing an “inflation” signal that has been in place since July 2009. The above chart shows the price graph of the Reuters/Jeffries CRB Index and the timing of the most recent signal. The Inflation-Deflation Timer model turned bullish on inflation and commodities in late July and moved to a neutral stance this week, which represents a profit of about 8.5%. There is a possibility that the model could turn positive on inflation again. The commodity and stock markets appear to be staging an oversold rally, which could create a whipsaw condition and flip the model back to inflation. Such a reversal is likely to be a fake-out. For example, consider the technical position of gold, a leading indicator of inflationary expectations. Gold is facing significant resistance technical resistance that if faces if it were to rally significantly. Investors are overly eager to be bullish, which is contrarian bearish. Moreover, commodity prices as measured by the CRB have violated the uptrend line shown in the above chart. An investor who strictly follows the Inflation-Deflation Timer model would move from a position of holding a basket of commodities into a 100% equity allocation. However, I would be inclined to be more cautious than to assume the risk of an all-equity portfolio. There is substantial valuation risk embedded in the stock market. The chart below shows the Tobin Q ratio, or the market value of a company divided by the replacement value of the firm's assets. (A low Q, between 0 and 1, implies undervalue while a high Q, over 1, implies overvalue.) 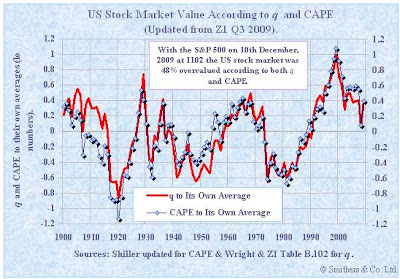 Right now, it indicates that the S&P 500 is substantially overvalued. In addition, other respected investors believe the stock market to be overvalued. John Hussman believes fair value is between 672 and 810. Jeremy Grantham has a fair value estimate of 860 on the S&P 500. As well, stock and commodity prices have violated a number of important technical trendlines. This loss of momentum also indicates that investor sentiment may be turning against the investment thesis of economic recovery. The combination of a valuation headwind and neutral or negative price momentum makes us highly nervous about a full all-equity commitment. Under these circumstances, I would be inclined to add a greater bond component to a balanced fund portfolio. Scott Grannis put up a Misery Index update last week and the picture isn’t pretty. The misery index is probably worse than shown because the two components of the index, namely headline unemployment and CPI, are arguably understated compared to the 1970s – previous episodes of high misery in US history. We can’t escape the simple fact: The cupboard is bare. Greece benefitted from being in the Eurozone by getting very low interest rates, up until recently. Being in the Eurozone made investors confident. Now that confidence is eroding daily. And this week’s market action says rates will go higher, without some fiscal discipline. To help my US readers put this in perspective, let’s assume that Greece was the size of the US. To get back to Maastricht Treaty levels, they would need to cut the deficit by 4% of GDP for the next few years. If the US did that, it would mean an equivalent budget cut of $500 billion dollars. Per year. For three years running. The market is saying they don’t believe that will happen. For one thing, if the Greek economy goes into recession, the amount collected in taxes will fall, meaning the shortfall will increase. Second, it is not clear that Greek voters will approve such a plan at their next elections. Riots and demonstrations are a popular pastime. President Obama on Wednesday blamed the Democrats' stunning loss of their filibuster-proof majority in the Senate on his administration's failure to give voice to the economic frustrations of the middle class, a disconnect that White House aides vowed to quickly address as they continue to work to advance the president's agenda. This was a working-class revolt, and it reveals the danger to Democrats of not successfully addressing workers’ economic concern. Voters’ believed the federal government has helped Wall Street—61% say government recession policies have helped Wall Street and large banks a lot or a fair amount—but not average working people (only 18%). In other words, it’s not our fault - blame Wall Street. When (not if) things get worse, how long before the Daily Kos crowd moves from tax Wall Street bankers to stringing them up on lampposts? As Democrats struggle to respond to a surge of populist anger that has put them on the defensive, Republicans face a challenge of their own: How do you appeal to voters furious at big banks and Wall Street without alienating the party's traditional business allies? Right now, the natural tendency of the Right is to migrate towards the Tea Party movement. When things get worse, some of the extremist elements could move the consensus to the land of the skinheads and KKK under the banner of “law and order”. Blame the outsiders, the Jews, the blacks, the Muslims, the Chinese and their “slave labor”, etc. A radical lurch, regardless of whether it's to the Left or the Right, is unhealthy. I reiterate what I wrote in my post entitled Political stability and the middle class: “If the middle class crumbles, what happens to political stability?” We can only hope that the political consensus stays near the middle, because the alternative represents the tearing of the social fabric and political disintegration - and the markets won't like that one bit.